Over the past 45 years, vitreoretinal surgery has evolved considerably. Today, retinal surgeons have access to a wide variety of instruments for micro-incision vitrectomy surgery, which will result in more comfortable, safer, and efficacious surgery. We aim to expose some of the most relevant innovations for vitreoretinal surgery. Gerardo González-Saldivar has nothing to declare in relation to this article. David R Chow declares the following financial interests or relationships: consultant/advisor for Alcon Laboratories, Inc., Bayer Healthcare Pharmaceuticals, Dutch Ophthalmic Research Center (DORC) International USA and Katalyst; lecture fees for DORC International USA, OptoVue and Allergan; and equity ownership/stock options in public or privately traded firms, excluding mutual funds from Katalyst and Synergetics, Inc.
All named authors meet the criteria of the International Committee of Medical Journal Editors for authorship for this manuscript, take responsibility for the integrity of the work as a whole, and have given final approval for the version to be published. This article is published under the Creative Commons Attribution Noncommercial License, which permits any non-commercial use, distribution, adaptation, and reproduction provided the original author(s) and source are given appropriate credit. © The Authors 2018. Over the past 45 years, vitreoretinal surgery has evolved considerably. In 1972, Machemer et al. 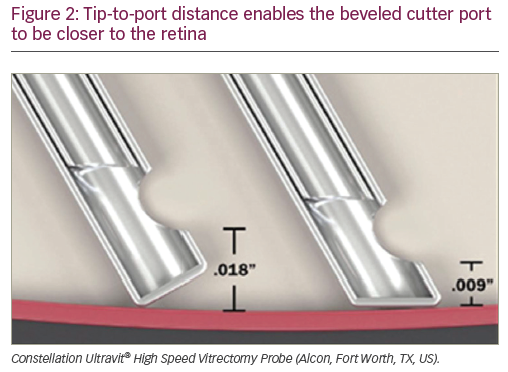 introduced the concept of pars plana vitrectomy with a 17-gauge vitreous cutter.1 Today, retinal surgeons have access to a wide variety of instruments as small as 27-gauge for micro-incision vitrectomy surgery. 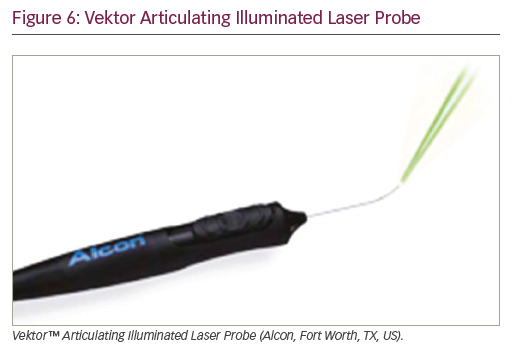 Progress has occurred not only in vitrectomy probes, which tend to be smaller, faster, and safer, but in all other aspects of our core instrumentation. 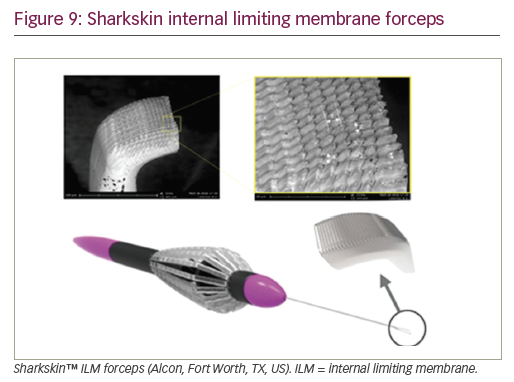 Recent developments include new techniques for endoillumination, handheld instruments and forceps, wound construction, and flexible laser probes. 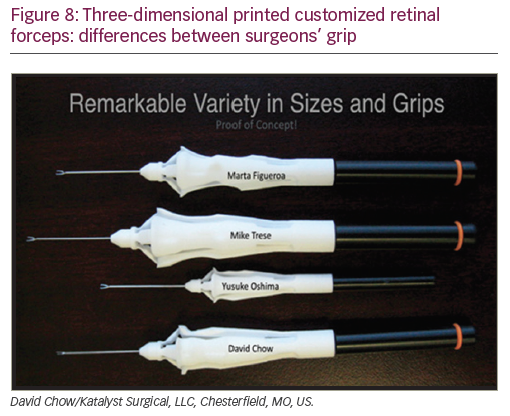 Knowing the peculiarities and possible specific uses for these new instruments increases the possibility of obtaining excellent outcomes in vitreoretinal surgery. 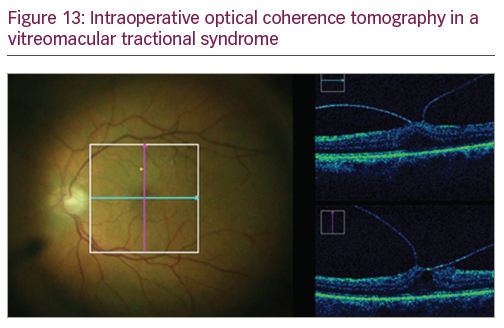 On the other hand, novel visualization technologies such as the “3D heads up” viewing system and the adaptation of intraoperative optical coherence tomography (iOCT) continue to improve existing viewing modalities: innovations that will result in more comfortable, safer, and efficacious surgery. 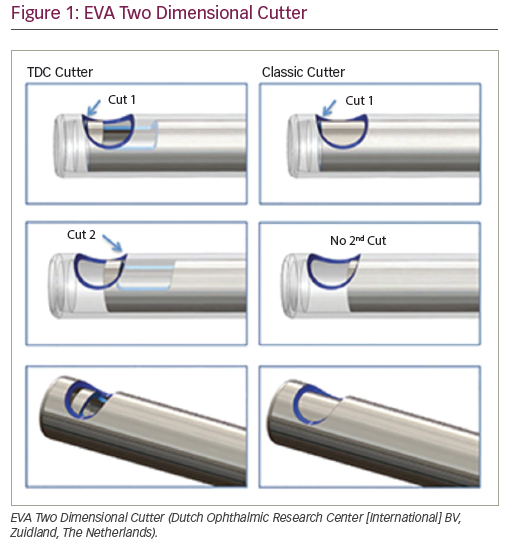 The Dutch Ophthalmic Research Center (DORC) has developed the Two Dimensional Cutter for their EVA phaco-vitrectomy system (DORC Dutch Ophthalmic Center [International] BV, Zuidland, The Netherlands). This features a larger aperture port with two cutting openings in the guillotine shaft that cuts vitreous in both the forward and backward direction of the probe (Figure 1). No matter the position of the blade, the port is never completely occluded. This allows cut rates of up to 16,000 cpm and a 92% duty cycle that creates constant aspiration flow. The Stellaris Elite™ system (Bausch + Lomb Retina, St Louis, MO, US) has introduced two new cutters for their platform. The Bi-Blade design features a dual-cutting action for each duty cycle due to the inner needle design, increasing the effective cut rate from 7,500 cpm to 15,000 cpm. Since the cutter port is open almost all of the time, the flow rates achieved with this cutter increase dramatically. 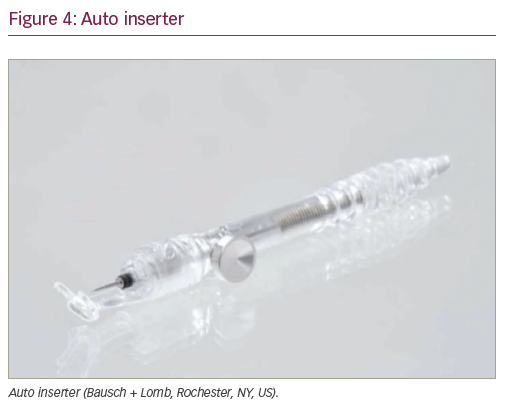 The auto inserter (Bausch + Lomb, Rochester, NY, US) is a device employed for the automated insertion of scleral cannulae instead of the conventional manual method (Figure 4). 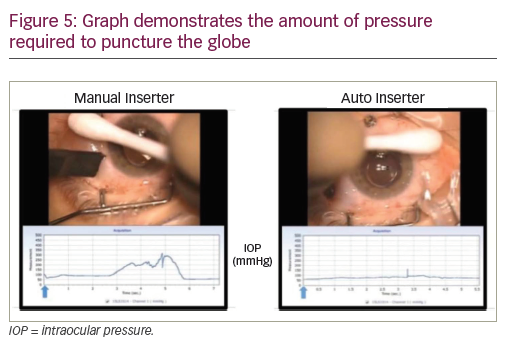 The automated insertion has been demonstrated to significantly decrease the amount of pressure required in order to puncture the globe (Figure 5). This might be a great solution for soft eyes, as very little pressure is needed for their insertion. 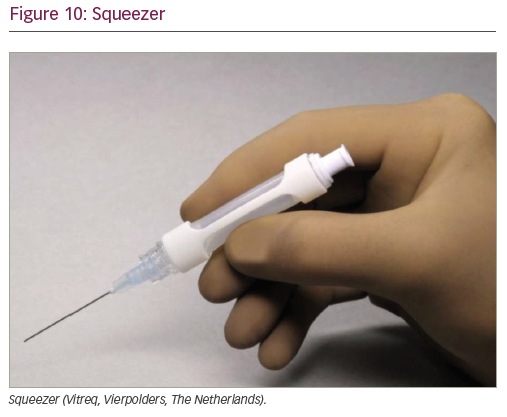 The Squeezer (Vitreq, Vierpolders, The Netherlands) is a disposable device used to obtain better control while injecting either dyes or perfluorocarbon liquids with a single-handed technique. 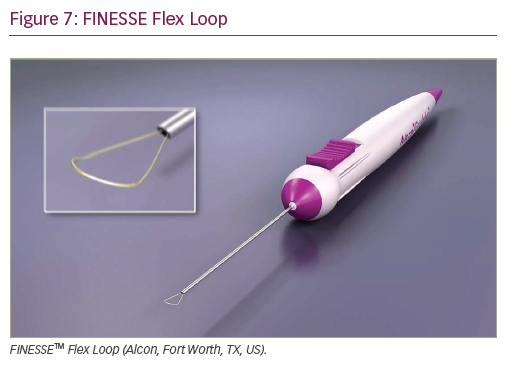 It consists of a silicone tube within a plastic frame and it incorporates a Luer Lock for filling the silicon chamber and another to attach the silicon tip cannula (Figure 10). The silicone tube can be pre-filled by a nurse, and only by squeezing it with the thumb and forefinger, either a dye or perfluorocarbon liquid can be carefully delivered. The Luer Lock prevents backflow of vitreous once squeezing pressure is released. 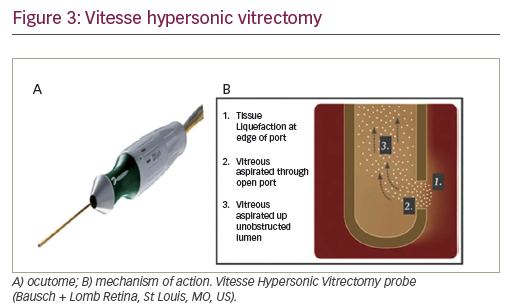 The MicroDose™ injection kit (MedOne Surgical, Inc., Sarasota, FL, US) allows the surgeon to adapt the vitrectomy console viscous injection set to use a 1 ml syringe (Figure 11). Placing a subretinal injection cannula in a 1 ml syringe will help the surgeon have absolute control while performing submacular surgery. A MicroDose injector adaptor can be connected to the Constellation, Stellaris, and EVA platforms. The advent of valved cannulae has improved the fluidics of vitrectomy by preventing aqueous reflux. However, the surgeon may experience difficulty introducing instruments through the valved cannula. To facilitate smooth insertion into valved cannulae, Katalyst developed a novel movable stainless-steel tube – the T-Tube™ (Katalyst Surgical, LLC, Chesterfield, MO, US) – with a diameter just larger than the cannula to be employed (Figure 12), improving the instrument’s ability to pass through the valve, facilitating the insertion of instruments through valved cannulae. It was in the 1970s when Dr John P Baele Jr developed a revolutionary microscope that, combined with a television system, gave ophthalmologists the opportunity to perform, for the first time, “heads-up” surgery.5 The NGENUITY® 3D Visualization System (Alcon, Fort Worth, TX, US) is one of the latest and most revolutionary innovations developed for vitreoretinal surgery. It provides both “heads-up” surgery and a three-dimensional visualization system (Figure 14). This technology has been gaining acceptance in the field because of its well-known benefits, which include precise focus, improved depth of field, greater magnification, and increased safety from phototoxicity due to lower light levels during surgery. Machemer, R. A new concept for vitreous surgery. 2. Surgical techniques and complications. Am J Ophthalmol. 1972;74:1022–33. Villegar VM, Murray TG. 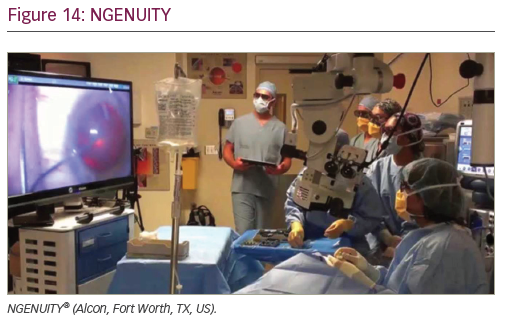 Know your retinal surgery toolbox - options abound for today’s vitrectomy operating room. Retin Physician. 2018;15:24–9. de Oliveira PRC, Berger AR, Chow DR. Vitreoretinal instruments: vitrectomy cutters, endoillumination and wide-angle viewing systems. Int J Retin Vitr. 2016;2:28. Francisconi CLM, Chow DRC. What’s new in vitreoretinal instrumentation? New designs, cut rates, and port migration aim to increase efficiency. Retin Phys. 2018;15:34–7. SFGATE. John P. Beale Jr. 1999. Available at: www.sfgate.com/news/article/John-P-Beale-Jr-2944882.php (accessed August 30, 2018).